Have you heard or watched the Muppets and CeeLo Green sing “All I Need is Love“? They recognize that Christmas is not all about the presents and bling – it’s really all about love. Yes, they focus a little too much on Santa, but the core message about love is spot on. We started talking about a love song. Now, let’s talk now about a real love story. Isn’t our culture full of both? Not just today, but through much of history. Think about all the creative energy that has been devoted to writing love stories, poetry, love letters, and love songs. If you start with the songs and movies and stories we know in our time and start scrolling back through history through the novels and poems and plays and epics, the list would go on and on and on and on. It seems that people, down through the ages, have been inspired and moved and confused and intrigued and motivated by love—and trying to understand it (mostly men, right?). The Hallmark movies tap into these romantic themes of love and Christmas. Throw in a Christmas tree farm or a toy store and you have a winner! Have you ever thought of the story of Mary & Joseph as a real love story? But, just because the culture and traditions of those ancient days looked different from ours doesn’t mean that there wasn’t deep love flowing between this historic couple—and possibly even romance. Mary and Joseph’s is a true human love story, but it is also a supernatural love story that involves you and me and every human who has walked or will ever walk this earth. The apostle John said it most simply and best: God is love. He wrote in 1 John 4:16, “So we have come to know and to believe the love that God has for us. God is love, and whoever abides in love abides in God, and God abides in him” (esv). This is the nature of our God. Love in its purest form. The love of God with Us is God’s perfect love in human form that we celebrate. And this is the love that knows exactly what we need, no matter what we are facing in this season. 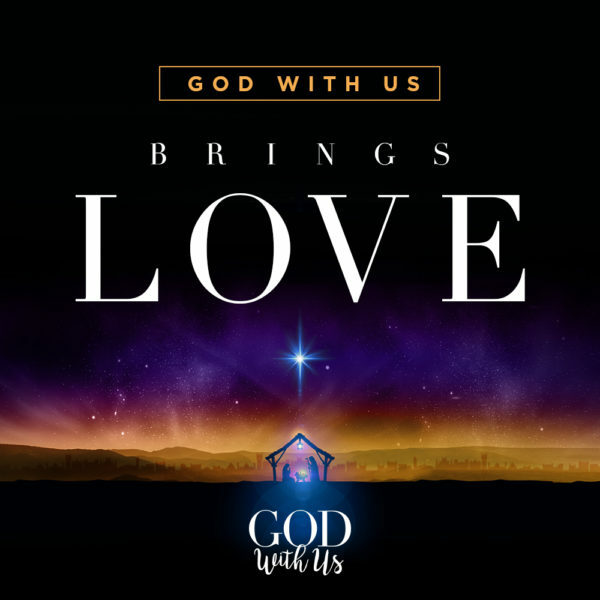 Whether it’s support from or restoration to another person or whether it’s an encounter with the God of the miraculous that you need, God’s love is with us. It is here for you. And it is making a way to accomplish God’s work in your life. As mind-blowing as it is, God’s love is eternal. It’s as never-ending as God Himself. It was. It is now. It will be. And He will never stop demonstrating His love in tangible ways that are both daily occurrences and history-changing events like Christ’s birth. Like any true, God-written love story, Mary and Joseph’s love didn’t end with themselves. It was built upon the foundation of God’s perfect, supernatural love, and they trusted God and followed Him on a crazy ride, unlike anyone else’s in history. And when they opened their hearts to God’s love, He allowed it to flow right through them as a small current in a overwhelming ocean—and this is the same one that sweeps us up. Knowing about God’s love is the starting point, but believing in Jesus Christ the Son of God sent to pay for our sins, is accepting God’s love. That’s when new life begins and a relationship with God is possible. If you have never accepted God’s gift of salvation, please come talk to me today. This will be your best Christmas ever as part of His family. That love we receive from God is meant to flow through our thankful hearts to impact those around us. To love them with the love of God. Others will know you love God if you love one another. Spend some time making a list of ways you can demonstrate love to those around you. God put you in a specific family, workplace, school, neighborhood to impact those specific people and show them the glory of God in His love pouring out through you.